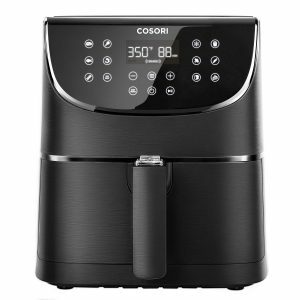 COSORI CP158-AF is an XL 5.8 Qt capacity, 1700-watt power, 11-in-1 electric hot air fryer with 11 presets on its LED digital touch display for cooking without oil. As an ETL and UL certified cooker it is very safe to use. And you can have a peace of mind with its two-year warranty by the manufacturer. 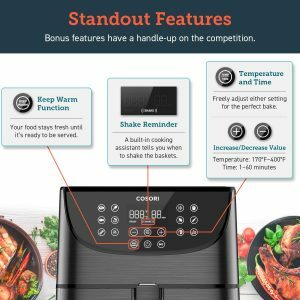 You’ll get a bonus cookbook of 100 healthy, easy and tasty main meal, side meal and dessert recipes in the box to help you out while getting used to air fryers. As one of the most popular air fryers at Amazon.com it is rated 4.8 out of 5 stars by 99 customers at the moment of this review. It weighs 14.4 pounds, measures 10 x 10 x 12 inches, has a slimmer footprint and won’t occupy a lot of space on your counter. With the air crisp technology you’ll need up to 85% less oil than the conventional deep frying. And you are promised the exact same taste and texture- crunchy on the outside and soft and moist on the inside. You can simply press one of the 11 preset buttons on the digital touch display, to cook a certain item at preset time and temperature. You’ll find preheat and shake reminders as well as the Keep Warm option. You can also set your own time between 1 to 60 minutes and temperature between 170 and 400 degrees Fahrenheit (77-205°C). And you can switch between Fahrenheit and Celsius. You’ll find plenty more recipes and video tutorials online from Cosori and others. You’ll be able to cook much faster with its 1700-watt power AC motor (120V and 60Hz) than traditional methods and the result will only be as good- crunchy and delicious. It comes with the built-in auto shut-off function to help avoid overcooking and the overheat protection to keep the motor and the unit safe. You can prepare enough food for 3 to 5 people in this XL 5.8 quarts (5.5 liters) air fryer. The non-stick basket measures 9 x 9 x 3.75 inches. Both the detachable drawer and food basket with non-stick coating are safe to be washed in the dishwasher and free of PFOA. You won’t be making any mess at all on your kitchen counter. The cool touch handle and the button guard will stop any detachment by accident. You may also want to check out the Cosori Air Fryer Accessory Set (C158-6AC) of six pieces, including a cake pan, a pizza pan, a metal holder, a multi-purpose rack with skewers, a silicone mat and an egg bites mold with lid. You won’t find a preheating option in other air fryers. And preheating for a few minutes is reported to clearly enhance the food texture greatly. It works very quietly without making any noise and you’ll hardly notice it is on. The exterior is made of solid plastic that is perfectly fine with the heat and does not come in contact with food. The 11 presets include chicken, bacon, steak, shrimp, seafood, veggies,, root veggies, frozen stuff, French fries and bread. Please note that Shake Reminder option works for only five presets- fries, veggies, root veggies, frozen foods and shrimp. Cosori Air Fryer is designed in the US and manufactured in China. And the company has facilities in the United States, Germany and Asia. We like the programmed presets, versatility, security features, dishwasher safe baskets and ease of cleaning, ease of use, cooking speed, quiet operation and cooking results with great taste and texture, longer warranty and the affordable price. It comes with a warranty of two years along with a 90-day money back guarantee. This includes customer support from Cosori for the life of the product.